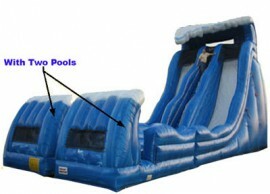 Rent the Goliath Inflatable Water Slide for your next birthday party, church function or special event. Want something big for your next party? Check out this gigantic, Goliath water slide. Available in Mission Viejo, Irvine, Orange County and the Los Angeles area. It has one climber and two slides. The slide is approximately 22 feet high at the platform and it is a straight slide at a 60-70 degree angle. It has a pool at the end of each slide, which is approximately 4 feet wide, 10 feet long and 3 feet deep. Customer must have a water hose with a connection that reaches the set up area. WE CANNOT TAKE THIS UNIT UP OR DOWN ANY STAIRS OR HILLS, THE PATH TO THE SETUP AREA MUST BE FLAT AND THE ENTRANCE TO THE SETUP AREA MUST BE AT LEAST 5 FT WIDE.Please add $40 for Monday through Friday rentals. Late night pickup (after 8PM) or overnight fees (after 10PM) apply. Additional delivery charges may apply. ADULT SUPERVISION IS REQUIRED AT ALL TIMES! $1,199 price is for up to eight hours of use.